Ordering The Origami 2008 Page-A-Day Calendar. 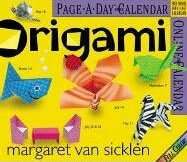 This is the sixth year of publication for Margaret Van Sicklen’s Origami Calendar. Starting with the 2004 edition I have a new partnership with Workman Publishing Inc. – so look for the origami calendar by the original author, endorsed by OrigamiUSA. In past years most stores, retail or e-tail, were out of stock by the beginning of December or even sooner. Get your copy early. You will be able to find the 2008 calendar at various local retail stores. I'll add a list of names in a little while.